»Why You Need To Know About Kishtwar In Jammu & Kashmir! Why You Need To Know About Kishtwar In Jammu & Kashmir! Looking for an unknown hidden stoppage where you can spend your vacation amidst calmness away from the hustle and bustle of the city life? Well, you need not worry now. The serene town of Kishtwar in Jammu and Kashmir is all here to meet your demands. Get yourself here and savour the unearthly world of valleys, hills, mountains, streams and grasslands. Wouldn't you love to go on this journey filled with excitement and thrill? There is a lot to more to explore within its boundaries. After all, it lies in the luxuriant expanse of the heaven on earth, Jammu & Kashmir. 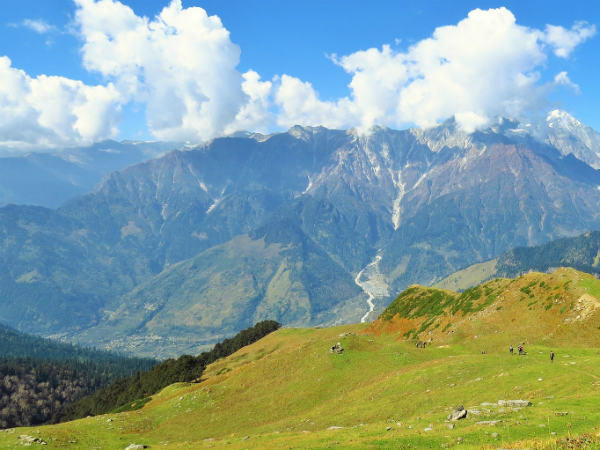 So, if you have been looking for a secluded and uncrowded paradise, then you must read on to know more about Kishtwar and how to reach it. Kishtwar is a year-round destination and hence, it can be frequented throughout the year. However, the best time to visit Kishtwar is from May to October when the weather is pleasant and temperature conditions are optimum, thereby, letting you enjoy its beauty to the fullest. Kishtwar is located amidst deep valleys and towering mountains and is known amongst local tourists for its virgin beauty. Even though it is a historic town with its history dating back to several centuries, it has gained popularity as a beautiful hill station and a perfect summer destination. As per historical records, Kishtwar has been mentioned in several ancient texts including Rajatarangini, a Sanskrit text written in the 12th century. Today, this hidden beauty is characterised by pristine rivers, flowery grasslands, lush green hills and snow-capped mountains. Doesn't it seem like a heavenly world? Over a period of time, it has become popular amongst offbeat travellers too. Isn't the reason of Kishtwar being a peaceful town away from the complexities of a city life enough? If not, then there is a lot more to do here apart from capturing the captivating beauty of its mountains, hills and valleys. You can visit the beautiful Chenab river and explore the wildlife of Kishtwar National Park. You can also savour the charm of its mountain passes and glaciers and explore them by trekking or mountaineering. Warwan Valley, located in the vicinity of Kishtwar town, has gained popularity as one of the top trekking destinations in India. So, why not fathom its greatness by taking up the expedition of exploring Kishtwar? By Air: If you desire to travel by air, then the best way to reach Kishtwar is to take a direct flight to Srinagar airport and then from there, a cab to Kishtwar. The distance between Kishtwar and Srinagar is 220 km and hence, it will take you an average time of 7 h to reach your destination from the airport. You can also take a bus from Srinagar to Kishtwar. By Rail: The nearest railhead from Kishtwar is located in Udhampur at a distance of about 152 km. Once you have reached the station, you can either hire a direct cab or catch a direct bus to Kishtwar. By Road: Kishtwar is well connected to all other major cities and towns by road and hence, you can easily approach it by a cab or a bus.